Alan Gottlieb, chairman of the Citizens Committee for the Right to Keep and Bear Arms, takes the 49ers to task for the half million dollar donation to anti-gun efforts. In doing so, he weaves in more football lingo than your average ESPN analyst in an amusing takedown of the hapless 49ers. In other words, Alan is in the red zone when he steps under center, takes the snap, surveys the defense, and rifles a touchdown pass for the winning score. BELLEVUE, WA – While the San Francisco 49ers racked up their eighth consecutive defeat over the weekend, the team’s announcement last week that it is contributing $500,000 to gun control efforts just might seal their fate as losers on a different level in the eyes of millions of American gun owners, the Citizens Committee for the Right to Keep and Bear Arms said today. “We’re throwing a flag on this play,” said CCRKBA Chairman Alan Gottlieb. “After weeks of protests at various NFL games that have seen players disrespect the National Anthem, resulting in sliding television ratings and fan disapproval, giving a half-million dollars to people who attack gun rights is worse than a clipping penalty. “The Hearing Protection Act might have a chance in Congress,” Gottlieb noted, “but for the Niners to give that kind of money to the opposition amounts to pass interference, and it should cost them more than 15 yards. “Professional football is supposed to be a sporting event that entertains and thrills fans,” Gottlieb observed, “not help finance efforts to erode their constitutional rights. Politics is threatening to ruin the games. The National Association of Sporting Goods Wholesalers holds an annual expo and meeting every Fall. NASGW is the organization for the wholesalers within the shooting and hunting industry. Their expo often provides a sneak peak at new firearms that will be released to dealers in the near future. Davidson's is one of the larger wholesalers in the firearms industry. They are headquartered in Prescott, Arizona. They used to be in Greensboro, North Carolina and would open their warehouse for retail sales before Christmas. I remember going to their sales a time or two in the 70s and early 80s. Davidson's Gallery of Guns has posted a number of videos of new items on their YouTube page. I hope Walther and Mossberg will have both of these firearms available at the SHOT Show's Industry Day at the Range. I think a 20 gauge Shockwave would be easier on the arm than the 12 gauge version. A coalition of firearms and civil rights groups filed an amicus brief supporting the writ of certiorari by the petitioners in Silvester et al v. Becerra. The lead organization in the brief is the Firearms Policy Coalition which was joined in the brief by the Firearms Policy Foundation, the Madison Foundation, and Gunowners of California. The Calguns Foundation sent out an update on their appeal for certiorari to the US Supreme Court regarding California's 10-day waiting period on Friday. Silvester et al v. Becerra challenges the 10-day waiting period for those individual who either holds a California issued carry permit or is an existing gun owner who holds a California certificate of eligibility. This case was a win at the District Court level but the 9th Circuit Court of Appeals overturned that decision. They bizarrely held that even existing firearms owners need a 10-day cooling off period. WASHINGTON, D.C. (October 27, 2017) – A Second Amendment lawsuit out of California is drawing attention at the Supreme Court and support from multiple groups, said gun rights group The Calguns Foundation, which joined Second Amendment Foundation and two individuals on a petition in September seeking the Court’s review of a Ninth Circuit ruling that upheld the state’s 10-day waiting period laws when they are enforced against law-abiding gun owners after they pass a rigorous background check. In this short video put out by the National Shooting Sports Foundation, Bryan Litz of Applied Ballistics and Berger Bullets discusses some of the things you should consider in your choice of ammo for long range shooting. The keys are ballistic coefficient of your bullet and consistency of your ammo. Remington Outdoor Company announced that they had appointed Anthony Acitelli as their new CEO. Mr. Acitelli was formerly the CEO of Taurus Holdings. He replaces James "Marco" Marcotuli who stepped down at the end of August after little more than two years in the position. Mr. Acitelli is a respected industry veteran with twenty plus years of leadership experience. In addition to successfully leading sales and marketing organizations, Mr. Acitelli most recently served as CEO of Taurus Holdings. Mr. Acitelli holds a Master of Business Administration from Thunderbird Global School of Management and a bachelor’s degree in Finance from the University of South Florida. Mr. Acitelli stated, "I am truly humbled and honored to become a part of America’s most iconic brands within the hunting and shooting industry. I look forward to the challenges ahead, while forging a course for the future with innovation and vision. We owe it to those that came before us and to those that will follow." I'm going to go out on a limb here. While Taurus may not be the most highly respected firearm company in the United States, it is a firearms company. I think it was past time for Remington to hire a CEO who actually had been in the firearms' business as opposed to making cars or investment banking. Now if Remington had really been thinking out of the box they would have mortgaged heaven and earth, got down on their knees, said their prayers, and begged Mike Fifer to come out of retirement. I'm not saying Fifer could have turned Remington around immediately but the man knows how to run a profitable gun company. At the instigation of NY Attorney General Eric Schneiderman (D-NY), a number of attorneys general, all Democrats, have signed on to a letter opposing national carry reciprocity. They specifically oppose HR 38 sponsored by Rep. Richard Hudson (R-NC) and S. 446 introduced by Sen. John Cornyn (R-TX). Schneiderman is joined in the letter by the attorneys general of Massachusetts, Oregon, Virginia, Rhode Island, Delaware, Hawaii, Illinois, Maryland, Connecticut, New Mexico, North Carolina and the District of Columbia. Each of our States allows concealed carry—as do all 50 states—but with carefully considered and long-standing substantive and procedural protections designed to address public safety concerns in our localities. Under the legislation, our residents would lose the protections that their legislators and law enforcement agencies have deemed appropriate, in favor of rules made by States legislating for very different local conditions. Rather than creating a new national standard for who may carry concealed firearms, these bills would elevate the lowest state standard over higher ones and force some States to allow concealed carry by people who do not qualify under their laws. This forced acceptance of the most permissive standards would also affect determinations about the proper level of safety training necessary to justify concealed carry and the criteria governing whether a person is too dangerous to carry a gun in a crowded place. The result of the proposed legislation would be a proliferation of potentially dangerous or irresponsible non-residents with concealed weapons in the States, cities, and towns across America that have made local judgments that certain regulations on the carrying of such weapons are necessary to protect public safety. Furthermore, the House bill would override some state laws that prohibit carrying concealed weapons in bars, schools, shopping malls, movie theatres, subways, or parks. States would not be able to enforce those restrictions; nor would local law enforcement officers reacting to specific risks to the public in such locations, which have tragically been the site of mass shootings in recent years. The text of HR 38 specifically says that state laws governing carry and posting of private property as well as the posting of state or local government properties including parks will not be superseded by this bill. In other words, these attorneys general have stated a bald face lie. Now to the hypocritical part. Both the commonwealth of Virginia and the state of North Carolina recognize permits from all other states. The law in Virginia was changed when Gov. Terry McAuliffe (D-VA) joined with Republicans in passing HB 1163/SB 610. This was considered a rebuke of Virginia Attorney General Mark Herring (D-VA) who unilaterally revoked reciprocity agreements with 25 states. Herring was the beneficiary of almost $1.3 million from Bloomberg's Independence USA PAC. Likewise, the state of North Carolina's law were changed effective December 1, 2011 to recognize unilaterally all permits issued by any state. North Carolina Attorney General Josh Stein (D-NC) ought to be aware of this because his own Department of Justice has a webpage devoted to this. While to the best of my knowledge, Josh Stein didn't receive money directly from Michael Bloomberg, the North Carolina Democratic Party did received $250,000 from him in 2016. Mark Herring and Josh Stein are out and out hypocrites. They want to deny a right to the rest of America that the visitors to their own states enjoy. Citizens of Virginia have a chance to get rid of Herring this fall but we in the Tar Heel State have to wait another three years before we are rid of anti-gun Josh Stein. An Enigma machine, that is. And it can be yours, if the price is right. Or, more accurately, if you can afford to send $245,000 on this piece of WWII history. 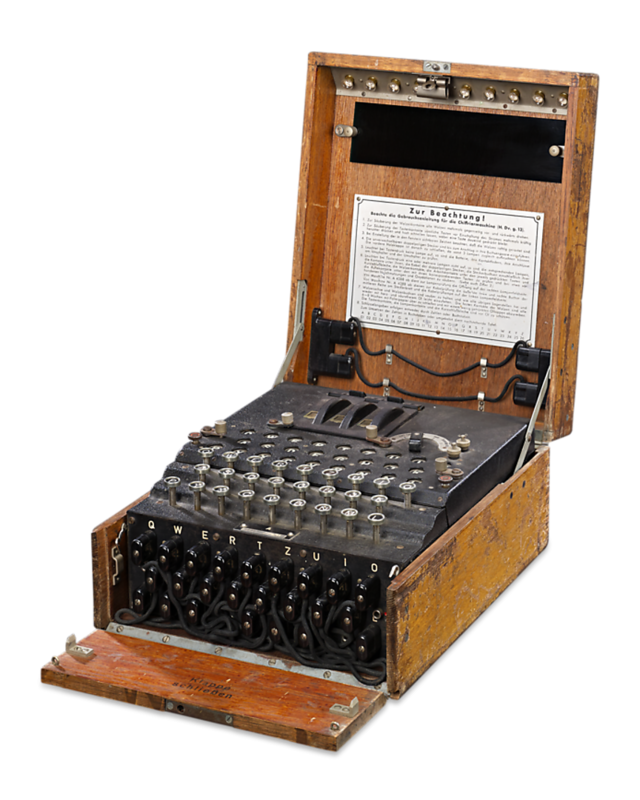 M. S. Rau Antiques of New Orleans has an Enigma I three-rotor cipher machine for sale. From what I can tell, this was an early Wehrmacht Enigma cipher machine as they became more sophisticated as the war continued. This highly important three-rotor Enigma I machine was used by the German Army during World War II. This machine, manufactured in Berlin, features three moving code rotors, or "walzen" (wheels), and a "steckerbrett," or plug board. It is believed that the acquisition of an Enigma, and the subsequent deciphering of the German codes by the Allies, shortened the war in Europe by at least two years. A few of these vital intelligence tools survived the war, existing examples of Enigma machines are exceptionally rare, with almost all known models currently held in museums. The Enigma machine was an advanced electro-mechanical cipher machine developed in Germany after World War I. The machine, called the “M” machine by the Germans, was used by all branches of the German military as their main device for secure wireless communications until the end of World War II. Several types of the Enigma machines were developed before and during World War II, each more complex and harder to code break than its predecessors. In addition to the complexity of the Enigma machine itself, its operating procedures became increasingly complex, as the German military wanted to make Enigma communications harder to code break. The effort to crack the codes generated by an Enigma was an international affair. In 1929, the Poles intercepted an Enigma machine being shipped from Berlin and mistakenly not protected as diplomatic baggage. The Poles were able to determine the wiring of the rotors then in use by the German Army and used them to decrypt a large portion of German Army traffic for much of the 1930s. In 1939, the German Army increased the complexity of their Enigmas. The Poles, realizing time was running out before the Germans invaded, decided in mid-1939 to share their work, and passed to the French and the British some of their ersatz 'Enigmas,' information. The information was shipped to France in diplomatic baggage; the British share went on to Bletchley Park, where the British secret service had installed its Code and Cipher School for the purpose of breaking the Germans' message traffic. There, British mathematicians and cryptographers, chess players, bridge players, and crossword puzzle fans, among them Alan Turing, managed to conquer the problems presented by the many German Enigma variations and found means of cracking them. Many of the existing Enigma machines are in museums. For example, the US National Cryptologic Museum has a four-rotor Kriegsmarine Enigma cipher machine that was used in the latter part of WWII. The history of cryptology has always been a bit of an interest of mine. That is because my mother worked for the Federal Bureau of Investigation during WWII as a cryptology technician. Part of her job involved searching suspected mail for microdots. In a box somewhere, I have her training notes from the FBI on codes and code breaking. We've all read about ghost guns. But what about ghost subs? It turns out the newer classes of Russian submarines such as the diesel-electric Krasnodar are extremely quiet and are like noiseless spots in the ocean. The Wall Street Journal examines them as well as a deep-diving compatriot (Yasen class) in the video below. I wonder how much of the stealthiness of the Krasnodar was stolen technology courtesy of spys and/or traitors like the Walkers. The Australian goes into much more detail in this story about the US Navy's search for the Krasnodar in the Mediterranean Sea. With the departure of Dan Gross as President of the Brady Campaign, the new leadership seems to have shifted some of organization's strategy to the courts. First there was the lawsuit against Slide Fire Solutions filed in conjunction with an class-action, personal injury firm in Las Vegas. That suit was filed less the same week as the Las Vegas mass casualty event. There is significant question whether that suit can even proceed given the Protection of Lawful Commerce in Arms Act. On Monday, the Brady Campaign filed suit in US District Court for the District of Columbia against the Department of Justice and the Bureau of Alcohol, Tobacco, Firearms, and Explosives. They are accusing the BATFE of ignoring two Freedom of Information Act requests for documents related to Associate Deputy Director Ron Turk's white paper and for documents related to warning letters or license revocations sent to Federal Firearm Licensees. By ignoring the FOIA requests after acknowledging receipt of them, BATFE provided the Brady Campaign with an opportunity to sue to get the info they seek. "The ATF has a critical role in monitoring the gun industry and keeping America safe from gun violence. We sought information about its work, and it did not respond, even though it is required to do so under federal law. We certainly hope that ATF is doing its job and the public deserves these documents so we can make sure that the ATF is doing everything it can to stop gun trafficking and other crimes," said Avery Gardiner, Co-President of the Brady Center to Prevent Gun Violence. Brady lawyer Mariel Goetz added, "The Brady Center has worked diligently to follow all procedures to obtain this information. Last week, our organization filed a class action suit on behalf of the attendees of the Las Vegas music festival who suffered through the deadliest mass shooting in modern American history. Today, we file suit on behalf of all Americans. We all deserve information about our government's efforts to regulate firearms and stop illegal gun trafficking. We need transparency to make sure that the federal government is doing what it should to stop gun violence." The complaint gives more detail on what they are seeking in their FOIA requests. (2) All notices of revocation of license and the accompanying ATF Form 4500s issued to federal firearms licensees from July 1, 2015 through June 30, 2017. As I see it, the FOIA request for any communications between ATF and then President-elect Trump's transitional team as well as any communication related to the White Paper with the NRA and firearms manufacturers is to dig up anything that they or their allies can use for political purposes against Trump, the NRA, and the firearms industry. Conversely, the second FOIA request is an attempt to have the BATFE give them information that they can use for lawsuits against dealers and distributors. This would be part of their attempt to pierce the PLCAA through their "Bad Apples" project. While FOIA was never meant to substitute for the discovery process in litigation, the courts have ruled that there is no prohibition against it either. Bearing in mind that I am not an expert on FOIA in the least and that I find it somewhat humorous that I am defending BATFE of all agencies, I think BATFE was correct in not releasing this information to the Brady Campaign. I think BATFE can make a very strong case that releasing warning notices/letters and revocation notices would interfere with potential law enforcement legal proceedings which is an exemption under FOIA. I think a strong argument could also be made that this should be considered commercial information which is a specific exemption as well. Likewise with the FOIA request for info on the white paper, since it was not a final statement of policy and could be considered part of the deliberative process, I think BATFE has grounds for not releasing this information as well. Where the BATFE screwed up was in not informing the Brady Campaign within 20 days of their request that they could go pound sand. This could be due to bureaucratic laziness on the part of BATFE's FOIA officer. Whatever the reason was it did provide the Brady Campaign the legal go-ahead to file suit. How a judge on the US District Court for DC might rule on this is anybody's guess. I will note that in addition to the Brady Campaign's own lawyers, they have pro bono lawyers from the mega-law firm of Covington and Burling. The marriage of gun controllers with big law is shameful in my opinion but progressives gotta do what progressives do. Despite what Asheville's Thomas Wolfe once wrote, you can go home again. The Ruger Rimfire Challenge was originally developed by Ken Jorgenson of Ruger, Michael Bane, and the late Nelson Dymond. In 2014, the responsibility for running the Ruger Rimfire Challenge passed to the National Shooting Sports Foundation and it became known as the NSSF Rimfire Challenge. On January 1, 2018, the Rimfire Challenge will pass to a new non-profit organization run by Jorgenson and Bane called the Rimfire Challenge Shooting Association. Thus, it will have closed the circle and returned home to its founders. NEWTOWN, Conn. — The National Shooting Sports Foundation® (NSSF®), the trade association for the firearms industry, is proud to announce that the NSSF Rimfire Challenge will be transitioned to a new organization: the Rimfire Challenge Shooting Association. The transition takes place Jan. 1, 2018. Michael Bane makes the announcement of the change on the video portion of his weekly podcast. You can see it at this link. As he notes, the first year will be about stability and communication. He doesn't see any major rule changes coming immediately. The existing rulebook along with examples of courses of fire can be found here. All shooting competitions go through life cycles and I think change like this is important. New management and new ideas along with a fairly low cost of entry should help the Rimfire Challenge continue growing and bringing in new shooters. The more that we can show that the shooting sports are fun, the less likely that the gun prohibitionists will be to convince the general public that guns are "icky". First there was the National Council to Control Handguns which became Handgun Control, Inc. for the next 20 years. Eventually this morphed into the Brady Campaign to Prevent Gun Violence. In making this name change in 2000, Handgun Control, Inc. did two things. This helped to soften their image from control to merely prevention. Just as importantly, by deciding to rename the organization after Jim and Sarah Brady, HCI was aiming to make sympathetic figures the face of gun control. Now that the Bradys have passed away, gun control needs to regain its cult of personality. Mike Bloomberg is not sympathetic nor is home-wrecking, socially and politically ambitious Shannon Watts. However, Gabby Giffords does make a sympathetic figure. It is probably a smart move on the part of these gun prohibitionists to reemphasize Gabby Giffords as the face of their organization. She is a sympathetic (and pathetic) figure who survived an assassination attempt in the prime of her life and seems to have regained some of what she lost from her injuries. With the renaming of the organization, the image of Gabby Giffords will always be more important than the reality. The image is that of the courageous survivor who fought back and is now leading the fight against "gun violence" (sic). The reality is that we don't really know what level of mental capacity she retains given her servere brain injuries and that she very well could be more of a puppet than an actual leader. As for her husband Mark Kelly, the image he wants the world to see is that of a devoted husband caring for his grievously wounded spouse and seeking to protect others from what happened to her. However, when I look at the reality of today's Mark Kelly, words like "puppet master", "leech", and the male equivalent of "gold digger" come to mind. Obviously, I don't think much of him as he seems to have abandoned the oath he took as an officer to support and defend the Constitution in favor of political and monetary gains. It will be interesting to how well gun control uses the cult of personality to make political gains. Time will tell. Rick Vasquez was the Assistant Branch Chief of the Technology Branch of BATFE. He has now retired and owns a firearms firm in Virginia. Before he retired from the BATFE, analysts under his management did the research and technical evaluation of the bump fire stocks submitted for approval. Rick reviewed their results and approved their evaluation. Moreover, he makes no apologies for it as it follows the law as written by Congress. In the video below, Rick is interviewed for a Vice News/HBO report. While Vice TV often has a leftist slant, they played it straight on this one and let Rick explain things. He also shows the reporter how you can bump fire without a device or special stock. Sen. Dianne Feinstein (D-CA), age 84 and the oldest person currently in the US Senate, has announced she plans to run for re-election in 2018. Despite her pro-Obamacare, pro-abortion, pro-climate change, gun-grabbiness nature, she is considered a moderate and "too bipartisan" for California. A number of potential candidates who might have run for the seat if she had announced her retirement have opted out of the race which may cost $50-100 million. State Senate President Kevin "Ghost Gun" de Leon (D-LA) has announced he plans to challenge her from the Left. Kevin de León announced Sunday morning that he would challenge veteran US Sen. Dianne Feinstein, saying he'll stand for a wing of the party that feels she no longer represents the progressive makeup of the state's Democratic Party and has not aggressively challenged the policies of President Donald Trump. The bold move by de León, the State Senate president pro tempore who is termed out next year, set up an internecine battle within the Democratic Party that some fear could draw attention and resources away from the seven competitive House races that could flip control of the US House of Representatives to the Democrats. But de León represents the younger generation of California Democrats who have been frustrated by Feinstein's mild criticism of Trump and the lack of opportunity for higher office because of the lengthy tenure of figures like Feinstein, House Minority Leader Nancy Pelosi, Gov. Jerry Brown and former Sen. Barbara Boxer (who retired and was replaced by Sen. Kamala Harris last year). Feinstein will be 85 at the time of next year's election. In a video statement released Sunday morning, de León said that in his three years as the State Senate leader he had worked to infuse "progressive California values in important policy efforts like immigration, women's rights, quality education, civil rights, job creation and fighting climate change." "We now stand at the front lines of a historic struggle for the very soul of America, against a President without one," de León, who is 50, said in his video statement, taking aim at Trump. "Every day, his administration wages war on our people and our progress. He disregards our voices. Demonizes our diversity. Attacks our civil rights, our clean air, our health access and our public safety. We can lead the fight against his administration, but only if we jump into the arena together." Given that California has a modified open primary system, the top two candidates regardless of party will move on to the general election. Thus, it is quite probable that the top two will end up being Feinstein and de Leon. I can imagine the anti-gun rhetoric along with misinformation coming out of their mouths. There will be a lot of eye-rolling going on. Thus, gun prohibitionists can rejoice. No matter who wins, the rest of free America loses. If you have read the novel Unintended Consequences by John Ross, you are familiar with his protagonist Henry Bowman. The book is something of a cult classic in the gun culture. Indeed, the very term gun culture has many of its origins in this book. I believe you can still obtain copies from the Accurate Press. One of the firearms that Henry and his father bought before the onset of the Gun Control Act of 1968 was a 20mm Solothurn S18-1000. While it is now considered a destructive device, back then you could get it through the mail. Imagine that! Ian from Forgotten Weapons recently had the change to fire one of these anti-tank rifles at the James Julia auction house in Maine. I'll let him continue the story of the Solothurn. If anyone knows what has become of John Ross, I'd love to know. His old website is long gone. I do know that he left the securities industry in the late 2000s. The NRA announced yesterday that it opposed both Sen. Dianne Feinstein's S.1916 and Rep. Carlos Curbelo's HR 3999. These bills would ban any part that could increase the rate of fire of a semi-automatic fire. The opposition was announced via an interview with the Washington Free Beacon's Stephen Gutowski. The text for Sen. Feinstein's S.1916 can be found here while the text of Rep. Curbelo's HR 3999 can be found here. The Trojan Horse in both bills is this language. any part, combination of parts, component, device, attachment, or accessory that is designed or functions to accelerate the rate of fire of a semi- automatic rifle but not convert the semiautomatic rifle into a machinegun. As I noted in earlier blog posts on the issue, this could be anything from a replacement trigger reset spring to a Geissele trigger to a lightweight AR bolt carrier to a heavier AR buffer. In other words, the BATFE Technology Division could use this to ban anything and everything related to a semi-automatic rifle short of the gritty mil-spec trigger. The quote of the day comes from Mike Kim, RPh., who owns a Washington, DC community pharmacy named Grubb's. His pharmacy has the contract to fill all the prescriptions for members of Congress. Grubb's delivers upwards of 100 prescriptions a day to the Office of Attending Physician which serves Congress. Not only is it scary that you have politicians with Alzheimer's that are still in office but a hack of their patient database would be quite the blackmail tool. You knew it was only a matter of time before some spineless Republican - but I repeat myself - introduced a bill that mimicked Sen. Dianne Feinstein's S. 1916 - Automatic Gunfire Prevention Act. Rep. Carlos Curbelo (R-FL) and Rep. Seth Moulton (R-MA) introduced the bill yesterday and it has 11 Democrats and 10 Republicans as co-sponsors. ‘‘(2) to manufacture, possess, or transfer any such part or combination of parts that have been shipped or transported in interstate or foreign commerce.’’. I call this bill a Trojan Horse because it can mean anything and everything that the regulators at the BATFE and DOJ want it to mean. Improved triggers, springs, and heavier buffers than stock could all be included under the wording of this bill. Here are the Republicans that have signed on as co-sponsors. Some are the usual suspects like Peter King; some should know better. I have put their NRA-PVF grade for 2016 after their names. Rep. Curbelo, the bill's sponsor, was rated a B+ by the NRA_PVF. It disgusts me to see that seven out of the 10 Republican co-sponsors were "A Endorsed" candidates in 2016. While the NRA meant for their statement of bump fire stocks to be a delaying device, it has also become cover for these Republicans. The average voter isn't going to go into the exact wording of the NRA's statement. They are just going to say, "The NRA says bump fire stocks should be banned and this is what these Republicans are doing." You know and I know that the NRA called for greater regulation which is much different than a ban. With regard to the Democrat co-sponsors, they are all rated F with the exception of Rep. Gene Green (D-TX) who got a B-. This bill needs to be stopped and stopped now. The Republicans supporting this bill need calls from their constituents and donors. I spoke with attorney Adam Kraut of the Prince Law Firm earlier today. I had asked him a question about the Protection of Legal Commerce in Arms Act and whether Slide Fire Solutions would be protected by it. He went over the requirements of the law and said he'd be posting on the case this afternoon. He published The Protection in Lawful Commerce of Arms Act and the Fate of Slide Fire in the Aftermath of Las Vegas this afternoon and it is well worth a read if you want a better understanding of just who is protected by the law. Had Slide Fire not been a licensed manufacturer (or dealer or importer) it is likely that they would be an open target to be sued without the PLCAA coming into play. UPDATE: Adam has a second post on the issue up at RecoilWeb.com that goes into more depth about the lawsuit itself. I'm reading yet another email asking for money from Americans for Responsible Solutions. They are criticizing the NRA for being respectfully quiet following the Las Vegas mass casualty event. As I continued to read, a jingle started playing in my head to the tune of Creedence Clearwater Revival's Proud Mary. All I could hear was "rollin' in the blood". This led me to rewrite a bit of the first few stanzas of Proud Mary. This is probably not the most respectful thing to say about a former member of Congress and I am truly sorry that she got shot by a mentally disturbed young man who had passed all background checks. Nonetheless, I get sick and tired of how the gun prohibitionists roll in the blood of the victims before the blood is even dry. Sharks are always attracted to blood and bottom feeders exist to scavenge the remains. Today, little more Friday, less than a week after the Las Vegas mass casualty event, the Brady Center's Legal Action Project in conjunction with Las Vegas class action law firm Eglet Prince plan to file suit in Clark County District Court against Slide Fire Solutions, LP, and other manufacturers and sellers of bump fire stocks. The case is being filed on behalf of everyone who attended the Route 91 Harvest Festival concert on October 1st. The suit will ask for both compensatory damages for the cost of counseling for emotional distress and for punitive damages. LAS VEGAS – October 10, 2017. A class action lawsuit was filed in the District Court of Clark County Nevada on behalf of victims of the deadliest mass shooting in American history that took place on October 1, at the Route 91 Harvest Festival. The suit, filed by Las Vegas law firm Eglet Prince and the Brady Center to Prevent Gun Violence, is against Slide Fire Solutions, LP and the sellers, manufacturers and marketers of "bump stock" devices which convert semi-automatic weapons to the functional equivalent of a machine gun. This case is on behalf of all the festival goers who suffered emotional distress as a result of the shooting. The lawsuit asks the defendants to pay for the costs associated with counseling and other treatment for emotional distress. The lawsuit also asks the court to award punitive damages. The lawsuit alleges that such damages are appropriate for defendants who provided a product that turned a semi-automatic gun into the functional equivalent of a machine gun, thereby evading longstanding federal law. The lawsuit asserts that Slide Fire Solutions, LP was negligent in developing and marketing "bump stocks" to the general public without any reasonable restrictions, thereby subverting federal law that has highly regulated machine guns for over 80 years. According to the Complaint, "this horrific assault would not and could not have occurred, with a conventional handgun, rifle, or shotgun, of the sort used by law-abiding responsible gun owners for hunting or self-defense." The complaint goes on to allege that the damage caused to the plaintiffs, "resulted from the military-style arsenal that the defendants manufactured, marketed, and sold to the public, without any reasonable measures or safeguards." The people who attended the concert have suffered so much already. The physical injuries are staggering, and we know the emotional injuries can be equally severe and long term. Brady has decades of experience supporting the victims of gun violence and has been the only organization in the nation focused on seeking justice for them in the courts. The announcement was made at a press conference on Tuesday, October 10th at 10:30 am PST by Robert T. Eglet of Eglet Prince and Jonathan Lowy, Vice President, Litigation of the Brady Center. The event was held at the law offices of Eglet Prince 400 South Seventh Street, Suite 400 in Las Vegas. Beyond the obvious gun control political overtones of this case, Eglet Prince attorney Aaron Ford is also the Majority Leader of the Nevada State Senate. His campaign finance reports don't indicate any direct contribution from either Michael Bloomberg or Everytown. However, Everytown and their PAC did contribute over $600,000 to the Nevada Democratic Party. The Eglet Prince law firm itself is a big donor to both Democrats and to the trial lawyers' PAC "Citizens for Justice". The question is whether this case can go forward given the Protection of Legal Commerce in Arms Act. The Firearm Blog covered this in relationship to Gunbroker.com's decision to not allow any further sales of bump fire stocks on their website. Gunbroker.com asserts that the PLCAA doesn't cover the stocks. However, James Reeves who is an attorney and who writes for The Firearm Blog asserts the PLCAA does cover bump fire stocks but it is very questionable whether private sellers would be protected. Is a bump fire stock a firearm product? While the courts will have to make the final determination, I'm going to side with those who hold that it is covered by the PLCAA. If bump fire stocks are found to be covered by the PLCAA, then this case should either be moved immediately to US District Court or dismissed immediately. One would hope that the US Justice Department would file a motion in Clark County District Court asking that the case be moved to US District Court. Given the infestation of DOJ by the "deep state", I'm taking a wait and see attitude on that. In the meantime, we need to keep a watch on this and similar lawsuits. The full 30-page complaint can be found here. UPDATE: According to stories in both the Las Vegas Sun and the Las Vegas Review-Journal, the class action lawsuit was actually filed on Friday, October 7th. Avery Gardiner, co-president of the Brady Campaign, was quoted saying she does not think the PLCAA applies. That is an argument that is being made in the press who don't know the law but I doubt will be made in court. Under 15 U.S. Code § 7903 (4), a qualified product under the PLCAA includes "a component part of a firearm or ammunition." It can be reasonably argued that a stock - even a bump fire stock - is a component part of a rifle or carbine. Furthermore, Slide Fire Solutions LP and its founder, Jim Cottle, would qualify as a manufacturer and dealer respectively. Slide Fire Solutions LP holds a 07 manufacturer's FFL and Mr. Cottle a 01 dealer FFL. Both are protected classes under the PLCAA. The National Shooting Sports Federation and the Sporting Arms and Ammunition Manufacturers' Institute seem to be taking the same approach as the NRA on bump fire stocks: have the BATFE evaluate them under the existing law. All three groups are intent on keeping Congress out of this fight for the time being. They would prefer to have an agency regulation on the stocks than to have new legislation which would most likely go much further. Feinstein's S.1916 would certainly do that. I spent part of Saturday morning working the Grass Roots North Carolina booth at the Asheville Gun and Knife Show. Paul Valone, President of GRNC, was also helping out at the booth and we had a chance to chat. He told me we needed to put pressure on Senators Richard Burr (R-NC) and Thom Tillis (R-NC) over Sen. Dianne Feinstein's moves to outlaw bump fire stocks. Paul said it was only a first step for Feinstein and having read her bill I agree. The bill itself contains what I consider a Trojan Horse as it would outlaw anything that accelerated a semi-automatic rifle. The alert that Paul alluded to in our conversation was released late this afternoon. It asks gun rights supporters to call and email Senators Burr and Tillis as well as Majority Leader Mitch McConnell regarding Feinstein's ban bill. This past Wednesday, October 4th, Sen. Dianne Feinstein (D-CA) introduced S.1916 - Automatic Gunfire Prevention Act - in response to the Las Vegas mass casualty event. As of today, the bill has 38 co-sponsors. All the co-sponsors are Democrats with the exception of Bernie Sanders who is still listed as an Independent. (v)(1) Except as provided in paragraph (2), on and after the date that is 180 days after the date of enactment of this subsection, it shall be unlawful for any person to import, sell, manufacture, transfer, or possess, in or affecting interstate or foreign commerce, a trigger crank, a bump-fire device, or any part, combination of parts, component, device, attachment, or accessory that is designed or functions to accelerate the rate of fire of a semi- automatic rifle but not convert the semiautomatic rifle into a machinegun. The prohibition would not apply to any agency or department of the United States or to those of any state or local government. The full text of the bill is here. As I've said many a time when it comes to legislation, the devil is in the details. More importantly, it will be in how the courts and the Bureau of Alcohol, Tobacco, Firearms, and Explosives choose to interpret any part, etc. that is designed or functions to accelerate the rate of fire of a semi-auto rifle. I foresee that items like the Franklin Armory binary trigger systems would be banned under this bill even though not explicitly named. Where I think it will get dicey is with springs and drop-in triggers. Will a stronger trigger return spring or a lighter hammer spring be considered items that function to accelerate the rate of fire? Would anything that makes for a smoother and/or lighter trigger pull fall under the rubric of this bill? Indeed, would using a rubber band from an office supply store (or that your mail is banded with by the USPS) be prohibited by this bill? SayUncle has a number of examples of bump firing without using any of the explicitly banned items. I attended the local gun show yesterday. In my 3 hours there, I saw only one person with a Slide-Fire stock. I don't know if he had just bought it or had it with him to sell. Bump fire stocks are novelty items in my opinion. I don't have a need for one nor do I intend to buy one. That said, I think this bill needs to be killed. No bill introduced within days of a serious tragedy is meant to address the problems behind the tragedy. They are strictly to make political hay. This bill in particular is meant to stick it to the gun culture. The all encompassing weasel words after trigger crank and bump-fire device are so open for interpretation that you won't know what is legal and what is not. That is just not good legislation. H/T Tiffany Johnson for the link to the bill's text. There are those great lies we all know. Things like "the check is in the mail", "I'm from the government and I'm here to help you", and "I'll respect you in the morning." I'd to add another that is quickly becoming all too obvious in the post-Las Vegas mass casualty event hysteria: "I'm a Republican, I respect the Second Amendment, and if you vote for me, you can be assured I'll never vote for a gun control bill." Consider these comments from North Carolina Republican congressmen. All of these comments were published in the Raleigh News and Observer yesterday. If somebody, just like any other avenue, is circumventing that law, then I think it’s something we should take a look at it. My first impulse is that could be a problem,” said Rep. Mark Walker of Greensboro, who is chairman of the conservative Republican Study Committee. Meadows said ATF may be able to change a rule or regulation that could solve the problem. The federal government allowed the sale of “bump stocks” in 2010. “What enforcement capabilities are already in statute as it would relate to this? Is there a need for additional legislation?” he said. Rep. Walter Jones, a Republican who represents much of eastern North Carolina, said he hasn’t had much time to study the “bump stock” issue. He planned to look into it this weekend. The statement by the NRA on bump fire stocks will be used by Republicans to give themselves cover. My problem with their statement is that it looks like pre-emptive surrender on a firearm accessory that has been already approved by the BATFE. While that statement may just be a delaying tactic as Sebastian contends, I still think the optics of it are bad. Few people will actually parse the statement to see what the NRA actually said and will assume incorrectly that they are for a ban on bump fire stocks. As I wrote on Thursday, "However, if bump fire stocks are banned now what is to say that other gun parts such as adjustable stocks or standard capacity magazines won't be banned later. If you open the door to the ban on one thing, don't you open the door to the ban of anything firearm related?" It is a slippery slope. Our opponents recognize this and it is a feature to them. As House Minority Leader Nancy Pelosi (D-CA) told a reporter, ""They’re going to say, 'You give them bump stock, it's going to be a slippery slope.' I certainly hope so." In the meantime, call, write, and fax your senators and representatives. They need to hear from you now in very clear and unambiguous terms. Links for the four Republicans quoted are above. You can find your representative by putting in your zip code here. The Firearms Policy Coalition, unlike the NRA, is refusing the cave to those who call for a ban on bump fire stocks. The FPC is a coalition of state level gun rights groups that is a 501(c)4 grassroots, non-partisan, public benefit organization. Being as they are based in California, they have seen first hand the various incremental attacks by the gun prohibitionists. In depraved acts of self-centered posturing, politicians who do not respect our Constitution are leveraging the recent tragedy in Las Vegas to push for more unconstitutional bans and restrictions on common, semi-automatic firearms and their accessories. These important Second Amendment-protected instruments are purchased, possessed, and responsibly used for lawful purposes by millions of Americans across our great nation. Just as blogs and websites are protected by the First Amendment, and the Fourth Amendment’s shield against unreasonable searches and seizures applies to advanced devices like an iPhone, so too are modern semi-automatic firearms like AR-15s and their appurtenances protected by the Second Amendment. Law-abiding gun owners will not be bullied by killers or politicians, nor will we give up fundamental individual liberties at the shrill cries of Marxist Democrats or unprincipled Republicans, wealthy Hollywood elitists, the alt-left news media, or billionaire-backed Astroturf groups. All unconstitutional laws are unjust, illegitimate, and offensive to the rule of law—even if they are enacted in response to a very real tragedy. FPC opposes all restrictions on the acquisition, possession, carry, and use of common, semi-automatic firearms, ammunition, and accessories by law-abiding people. 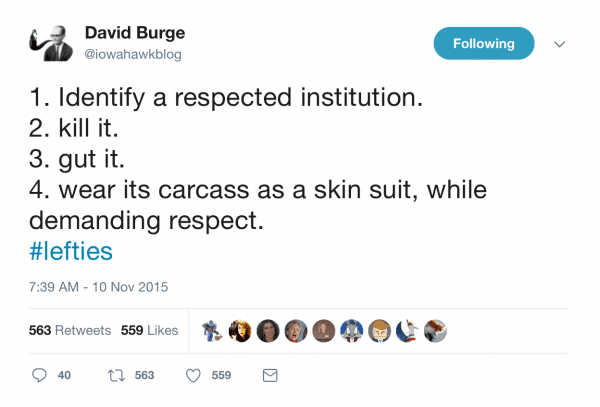 Whatever the conversation our country might wish to have about the evils found in human nature, and whatever questions we as a society might have about how to better address those moral and cultural deficiencies, no legitimate answers will be found in additional emotion-driven gun control laws that undermine our American system of ordered liberty.